Okay guys let me bring you up to speed, Kanye (@kanyewest) has recently released a new single ‘Only One’, click here to listen collaborating with legendary singer Paul McCartney (Or so we thought). I don’t whether it’s just the ignorant youths of today or there’s generally foolish people out there who would ask who in god’s name is Paul McCartney??! Like if this is a joke I can fully understand. I mean, asking who Paul M is, is like asking who’s Michael Jackson? Anyways, moving on. Apparently there was an uproar based on the mystery singer jumping on Kanye’s track, referring to Paul as ‘Unknown singer’. “I don’t know who Paul McCartney is, but Kanye is going to give this man a career w/ this new song! !” wrote OVOJosh. 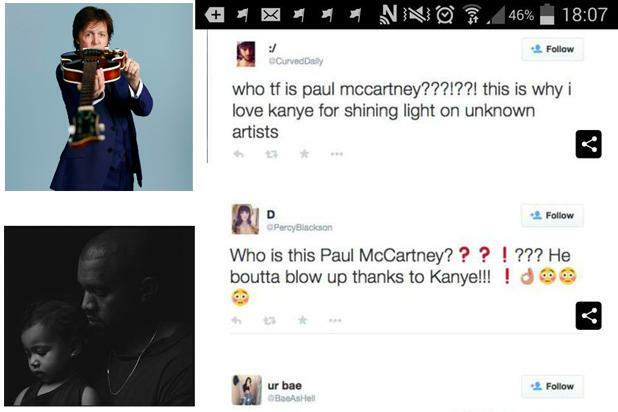 “Kanye West did a song with Paul McCartney and people on Twitter are asking who Paul McCartney is and now I understand domestic terrorism,” wrote KimballBennion. Luckily, Paul wasn’t going to let the comments get to him, instead he responded in a very calm and rational manner.